A tale of gangsters, betrayal and one vengeful soul hunting the twelve most powerful crime lords in the world. Whether an avid listener of Apollo Brown or not, there's no arguing that the beats on this album deliver. 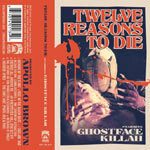 This version of ''Twelve Reasons to Die'' is an alternative to the original version recorded over production by Adrian Younge. Entitled ''The Brown Tape'' because at first it was on cassette only, but purely as a ridiculously limited promotional bonus with the Adrian Younge-produced CD. Now those who missed the promotion have a second chance!